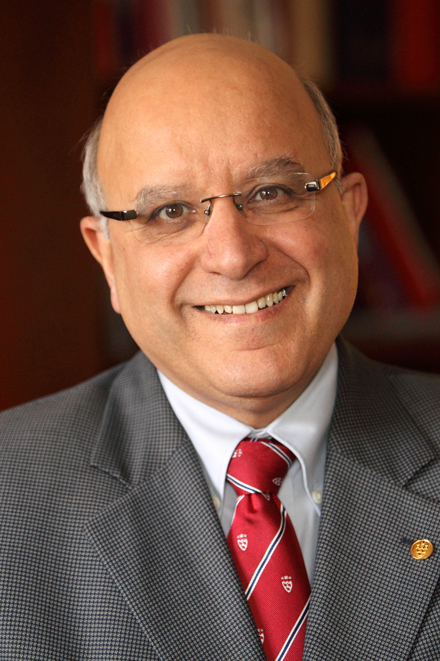 Budget Book FY2015: Four Burning Questions for Provost Anthony C. Masi. After the Budget Book was approved by the Board of Governors on April 28, the McGill Reporter sat down with Provost Anthony C. Masi to talk about Budget FY2015, reinvestment, funding our priorities and McGill's financial future. After the Budget Book was approved by the Board of Governors on April 28, the McGill Reporter sat down with Provost Anthony C. Masi to talk about Budget FY2015, reinvestment, funding our priorities and McGill’s financial future. How would you summarize McGill’s budget for fiscal year 2014-2014 (FY2015)? Remember that the Budget Book presents a plan to support and advance our University’s mission and goals. The allocations start with FY2015 but extend over the subsequent four fiscal and academic years to 2019. • provide incentives to units to diversify revenues, in line with our values and mission. If current revenue assumptions hold and we follow the plan outline in Budget Book FY2015, McGill will be in a solid position to address our existing financial challenges and still have some funds to dedicate to our essential strategic priorities. The unknown factor that could change dramatically is the level of reinvestment that the Provincial government will make. Once we have more complete information, it may be necessary to revise the FY2015 budget with an addendum. How does the budget plan deal with the uncertainty around Quebec government reinvestment? We have budgeted enough for our main commitments, regardless of the level of reinvestment for FY2015. Those are salary increases for our staff, pay-equity adjustments and extra contributions to keep the defined benefit portion of our pension plan 100 per cent solvent. However, if the promised $27 million operating reinvestment does not materialize, or is considerably smaller, the impact on McGill’s operating revenue will be significant. That is when options will have to be considered: Should we grow the proposed $7 million annual deficit projected for FY2015? Should we redistribute, redirect or delay funding some strategic priorities? We should never just abandon our priorities. Rather, they are our strategic guideposts in bad times as well as in good times, so we have to find ways to pursue them. Admittedly, our means to do so will be more limited, but we have to keep striving in the direction of our top academic priorities. Again, we will know more when the new government tables a budget, most likely in early June. In consultations with Deans and VPs, we may then have to revise some of the plans currently laid-out in Budget Book FY2015. We will keep the community updated on these developments. How does Budget Book FY2015 propose to concretely fund McGill’s strategic priorities? The budget for FY2015, which was adopted by the Board of Governors at the end of April, makes provision for the five priorities outlined in the Principal’s address Open, Connected, Purposeful: McGill and the Next Five Years: a McGill commitment to educational choices, an environment that is supportive of cutting edge research, a University that is welcoming to partnerships with the Community, campuses that have an agile, aspirational, and accountable workforce, and are equipped with sate of the art physical and virtual infrastructures. • effectively managing our financial, capital and human resources. Faculties and Administrative units have the responsibility to align their specific objectives and actions with those main University-wide priorities. The Office of the Provost enters into annual agreements with each Faculty and Administrative unit which describe the specific projects they will target in the context of those main strategic priorities. This year we have included some details on all four funds of the McGill budget: operating, restricted, plant, and endowment. For more details, I invite people to read the “McGill University Strategic Plans” section of Budget Book FY2015, starting on page 29. We are coming out of a period of substantial hardship related to reductions in our operating budget while news from Quebec City continues to be bleak. Are you optimistic about the future of our finances? By definition, Provosts are people who see the glass half-full. Quebec governments are perpetually struggling to balance the books, so we have not depended too much on what will be limited government funding for the foreseeable future. My job is to work with Deans and VPs to plan and prepare for lean times, while proposing spending that positions McGill to come out of the difficult times stronger than before. Barring any new, drastic shocks to the Quebec contribution to McGill’s operating budget, the efforts we made last fiscal year have put us on a solid and sustainable path. Now, we have to focus on maintaining those savings. We must also look for ways to diversify our revenues, both operating and capital. And we will continue to work closely with the government to make sure its policies enable McGill to excel in the pursuit of our mission. In my preamble to Budget Book FY2015, I thank the McGill community for all the efforts made over the past two years. I would like to reiterate my sincere appreciation for that ongoing hard work. The response of our community has indeed been remarkable. I know that while our resources have diminished in many cases, the expectations have not and many of us continue to face challenges in our daily jobs. McGill is in a transition phase. Our common task in FY2015 and beyond will be to address daily difficulties but never to forget McGill’s vision and mission. We must find good ways to reorganize our priorities and our processes. The world around us changes and evolves and so must we. While change is often difficult, embracing it can also strengthen our bond as a community. This is a task each and every one of us ought to undertake as we all contribute, through our daily work, to building McGill’s longevity and success. Principal Fortier often says that while we must address our challenges, we cannot let them define us. I think this is a great way of looking at the future with optimism and confidence, tempered by our own hard work, determination, and experiences.